Did you know students in Learning Ally schools can access human-read audiobooks at home all summer long? Here are ideas to ensure your students have what they need to read all summer to maintain progress, finish assigned summer reading and come back to school in the fall confident and prepared. 1. Sign up your students! Login and ensure your students are signed up for Summer Reading Together. 2. Follow the NEW Simple Summer Lesson Plan to prepare students for summer reading. This lesson plan will help you give students and parents everything they need to be successful this summer. 3. 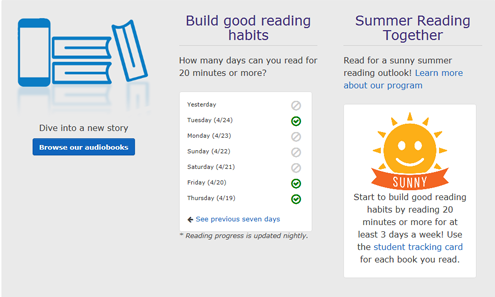 Encourage students to read every day for 20 minutes and to log in at least once per week to find their daily progress markers on their student dashboard. 4. Motivate them by sharing about the prizes and social media challenge! Twenty prizes will be given for monthly and overall summer reading activity, including $100 gift cards! Students who share their books recommendations #mysummerbook and vocabulary words #mysummervocab using #SRT19 and tagging @Learning_Ally will be entered in a random drawing for a Chromebook. 5. Let’s read together! Read along with your students this summer and track your own progress using our printable calendar. Keep in touch with your students through social media and share your reading activity. Learn more at LearningAlly.org/summer or access all the educator resources. Want to participate in Summer Reading Together with Learning Ally at your school?